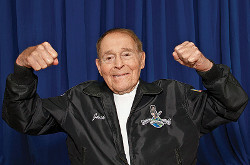 Jack Lalanne, the man whose name was synonymous with fitness for decades and winner of the United States Sports Academy’s 1995 Dwight D. Eisenhower Fitness Award, died Sunday at the age of 96. Lalanne was born 26 September, 1914 in San Francisco, CA and admittedly, during his childhood days was addicted to sugar and junk foods. At age 15, he heard exercise advocate Paul Bragg speak on health and nutrition, which motivated Lalanne to focus on his diet and exercise habits. He studied Henry Gray’s “Anatomy of the Human Body” and concentrated on bodybuilding, chiropractic medicine, and weightlifting, something virtually unheard of in the 1930s. In 1936 Lalanne opened his own health spa in Oakland, Calif., where he designed the world’s first leg extension machines, pulley machines using cables, and weight selectors, now a standard in the fitness industry. While the Lalanne fitness model was the Genesis of later fitness movements in the 20th century, he found ways to keep himself from fading into obsolescence. He will most be remembered for ‘The Jack La Lanne Show,” on television in the 1950s, where he did not use a lot of mechanical equipment His biggest ‘tool’ was a straight back chair. His audience, mostly women, would get that chair from the kitchen each morning and go through the routines with him much like future generations would follow Jane Fonda. His show lasted for 34 years. He also incorporated a stretchable cord to tighten up muscles called, ‘The Glamour Stretcher.’ He invented the “Jack LaLanne Juicer” that allowed people to make their own fruit and vegetable juice without buying and throwing away a lot of plastic bottles.